Mark’s mother, and her mother, died without knowing what caused the “family joints” and their various medical problems; he had no idea what was wrong either until his eventual EDS diagnosis at age 43. The foundation’s literature was instrumental in getting that diagnosis and in providing information needed to live with EDS, and in return Mark thought he could help the foundation grow and communicate answers for other families with EDS. In the mid-1970s Mark discovered theater in Houston, starting in the creative side as a sometime actor but soon as a designer (sets, lighting, sound, graphics), musician, and composer. He quickly found nonprofits had daytime demands, too, and began working in nonprofit administration and public relations. His first professional home was Main Street Theater as part of their inaugural season in 1975-76, where he later served as co-producer of Main Street Theater Junior. His next home was Houston’s Stages Theater. Along with his creative contributions, his work as publicity director helped move Stages from a tiny basement on the bayou into a custom-built two-theater space as an Equity house, Stages Repertory Theater. He spent seven years there as staff music director/composer, frequent designer, and computer manager/programmer. Along the way in the 80s and early 90s, he contracted with many other nonprofits: Rice University, the Kodály School in Guatemala City, Duchesne Academy of Houston, Gilbert and Sullivan Society of Houston, Texas Opera Theater, and even a stint at Museum of Fine Arts, Houston as signage designer and public traffic coordinator for their first major international exhibition. As co-owner with his partner, Mark helped produce and write for a few years with a small independent children’s theater company, RAVE Productions. He took over a friend’s graphic design and typography business, and spent most of the 90s working in Spanish and English for printing companies until his EDS diagnosis in 2000. Mark began working with Ehlers-Danlos National Foundation as typographer, but quickly found because of his nonprofit experience he could be helpful in a variety of ways: illustrating and designing graphics; writing and producing the many publications of the foundation including Loose Connections and resource guides; and bringing up-to-date, relevant information to members and friends on the web site, Facebook page, and wherever else the foundation could reach those with EDS and their friends and families. 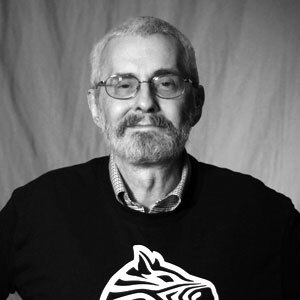 His work has been continually challenging, and changing as the foundation matured and grows into its expanded international mission as The Ehlers-Danlos Society. Mark’s “family joints” proved to have a very long history. While he knew growing up of at least three generations suffering connective tissue problems, he discovered the origins of his mother’s family to be in 1400 Lithuania and Poland. Surprisingly, there is documented evidence of an ancestor, the Blessed Michał Gedrojć, who was born in Vilnius with handicaps clearly associated with connective tissue; he lived with those handicaps until his death in 1785 as an Augustinian hermit in Cracow.